An exceptional cut flower, alstroemeria (Alstroemeria aurantiaca) is now gaining popularity as a garden plant outside its native South American habitat. Perennial where winters are mild, alstroemeria is a tuberous plant with arching, narrow green leaves. In spring and summer, its multiple stems bear clusters of yellow or orange, lily-like blooms. Cultivars in other colors are now widely available, according to the Missouri Botanical Garden. Alstroemeria's one drawback is its toxicity. A study by researcher Lars P. Christensen of the Danish Institute of Agricultural Sciences, published in the December 1999 "Contact Dermatitis," revealed that cutting alstromeria releases the allergen tulipalin A from its damaged areas into the air around the plants. A small amount of tulipalin also escaped from an undamaged flower. The research also showed that tulipalin A and other tuliposide allergens were present in the stems, leaves and flowers of the plants. Tulipalin may cause contact dermatitis, an allergic skin reaction, in sensitive people. The Toronto Botanical Garden suggests that nausea and vomiting also result from ingesting it in large amounts. Contact dermatitis after exposure different to tulipalin normally requires at least a day to surface. The reaction can linger for several weeks, notes dermatologist and King County master gardener Dr. Christina Merino, M.D, MPH, of the Washington State Department of Labor and Industries. The rashes resulting from poison oak and poison ivy are contact dermatitis. 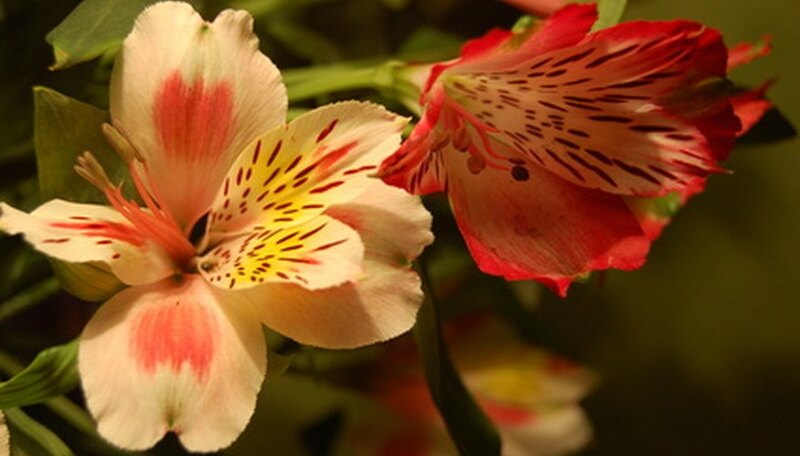 People develop sensitivity to alstroemeria's allergens over time. Florists and greenhouse or field workers who handle it on a regular basis are most at risk of contact dermatitis. Avoiding these striking garden and cut flowers because of potential allergies isn't always necessary. Lower your risk of becoming tulipalin-sensitive by wearing impermeable plastic gloves. The Danish Institute of Agricultural Sciences indicated that tulipalin may be an airborne allergen, so protect yourself with a long-sleeved shirt and long pants when you handle the bulbs, plants and flowers. Don’t touch your face, mouth and eyes while handling alstroemeria. Wash your clothing and gloves as soon as possible after working with it. Wash any areas that come in contact with alstroemeria immediately, advises the California Poison Action Line. If you still develop a rash, call your doctor or your local poison control center. Plants that cause toxic reactions in humans are likely to do the same in pets, cautions the California Poison Action Line. The ASPCA suggests that cats ingesting alstroemeria might experience nausea and vomiting. To be on the safe side, locate plants where they won't tempt your pets, and keep the cut flowers out of their reach as well. Are Tulips Dangerous for Cats?